Guest Post: NEITH CONTEMPT by Martin S. Kottmeyer - Vallee's Zombie Moon of Venus? Jacques Vallee, who seldom attends UFO conferences, spoke at the recent International UFO Congress, at which he solicited funds for a new 'deluxe' edition of his and Chris Aubeck's 2009 book, Wonders in the Sky. This has begun to draw attention, and scrutiny, toward the book, and much of what is turning up is not pretty. Blogger Jason Colavito has written some extended critiques showing carelessness and errors in that book. Colavito asks rhetorically: "Mr. Vallée, why did you repeat the same faulty translations, fabrications, and errors from Passport to Magonia in 1969 to Wonders in the Sky in 2009 until I finally caught you, all while holding yourself out as a scrupulous and rigorous investigator? 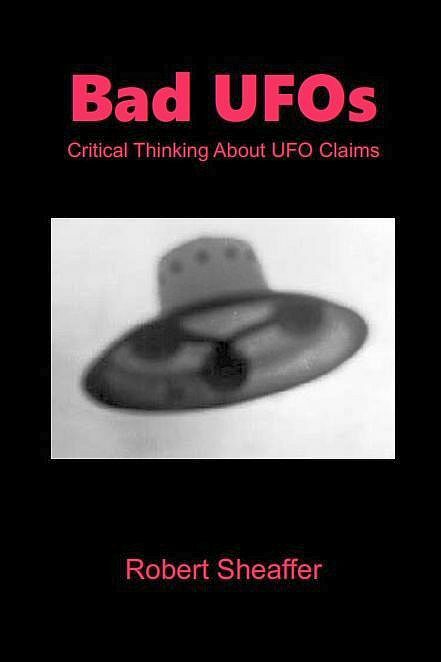 Kottmeyer remarks, "Did anybody not think it a bad omen to put on the cover an illustration of ufos seen during Alexander the Great's battles that reappears on p. 380 with a discussion showing the tale it tells to be a modern fraud?" And if "Neith," the "unidentified planetoid" allegedly orbiting Venus, is such a nothing-burger, why does it appear in the book nine separate times, like a Zombie rising from the dead? Jacques Vallee and Chris Aubeck, Wonders in the Sky: Unexplained Aerial Objects from Antiquity to Modern Times and their Impact on Human Culture, History, and Beliefs, Jeremy P. Tarcher / Penguin, 2010, p. 267; entry #355. COMMENT: The above image was generated using Redshift 5 Planetarium software. It was set for Copenhagen, Denmark and January 4, 1768. 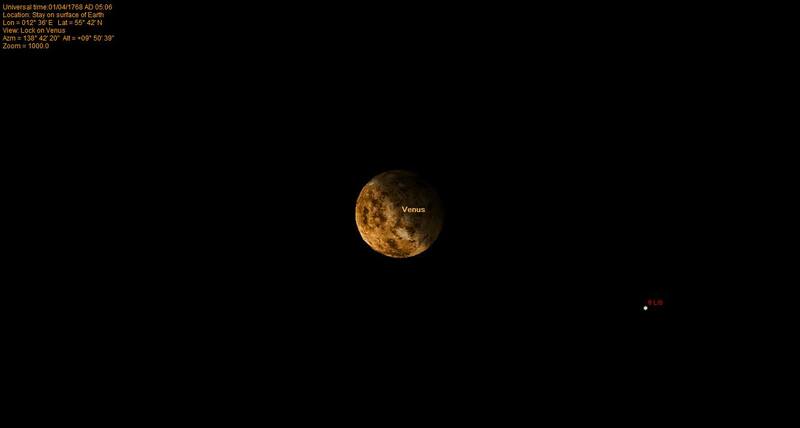 I have magnified the image of Venus (magnitude – 4.35 at the time) and its vicinity to 1000 power magnification. I let the time function run and stopped at the closest approach of the star Theta Librae. That happens around 5:06 Universal Time. It is a star that shines at magnitude +4.13. On most evenings it is visible with the naked eye. Using a measuring tool that was part of the program, I determined the separation came within a mere 1 minute of arc that evening I trust it can appreciated in this image that Theta Librae looks quite like a moon should look, roughly how a moon of Jupiter or Saturn looks through a telescope. I trust that Horrebow was probably not using this amount of magnification, but any astronomy buff should be able to work out that Theta Librae would have been visible at any magnification simply because it is visible to the naked eye even with no telescope at all. On this particular evening, though, you might have needed a telescope to separate the two – a minute of separation is impressively close. Aubeck & Vallee’s book includes 9 entries about Neith. The name was evidently taken from a goddess in Egyptian mythology. She was reportedly a fierce huntress and warrior, not too surprising given she was branded the “cow of heaven’. I will assert that using planetarium software I could generate plausible solutions for all the observations of the mystery satellite of Venus involving stars that pass rather close to Venus in those 9 entries. This would be re-inventing the wheel. Neith had been debunked in Nature magazine back in 1887. The Nature author looked into 33 observations / claims that Venus had a satellite. All but one had a good solution along the lines of either the positions of known stars or suspicions of optical ghosts and artifacts of the telescope lenses in use. The final one was guessed to be a minor asteroid passing near Earth. The Nature author did give precisely the solution I have presented here for Horrebow’s observation except he didn’t have planetarium software that could precisely generate this particular image. I personally don’t consider this information obscure. I first read of this solution in William Corliss’s Strange Universe series of books where he re-printed several articles about Neith he gathered in his trawling of scientific literature for anomalies. His books were quite well known among the Forteans when they came out and are still highly recommended. I had heard of it in other books by astronomers over the years as well. Kottmeyer's second image showing Venus with respect to the horizon, at the time "Neith" was spotted. Now a ufo buff must inevitably ask, what is Neith doing in an ufo book bearing a subtitle “Unexplained Aerial Objects from Antiquity to Modern Times.” How is a zombie moon around Venus categorized as an aerial object? It is a particularly ditzy move to include such astronomical material if you are going to start comparing the ancient material to modern ufo experiences. Do any modern ufos periodically anchor near Venus? There is obviously a category error here and including 9 such irrelevant claims is not merely weird, but could be viewed as potentially mucking up any statistical comparisons they make towards the end of the book. Bad as that is, Neith is not the only ‘super-construction’ improperly used in Aubeck & Vallee’s ancient ufo database. We’ll talk about that in a separate post. See also Joseph Ashbrook, “An alleged satellite of Venus” The Astronomical Scrapbook: Skywatchers, Pioneers, and Seekers in Astronomy 1984 and Sheehan's Planets and Perception 1988. Mr. X’s annotated Book of the Damned gives all the following references as Fort’s sources of what he knew about Neith: Martha Evans Martin. The Ways of the Planets. New York: Harper & Brothers, 1912, 140. The last report was made in 1791 by Montaigne, (not 1767). The other reports of this satellite were: in 1672 and 1686, by Cassini; in 1740, by Short, using two telescopes; in 1759, by Mayer; in 1761, during the transit of Venus, by Scheuten; in 1764, by Rödkier, Horrebow, and three others, at Copenhagen, and by Montbarron, at Auxerre. T.W. Webb. Celestial Objects for Common Telescopes. 4th ed. London: Longmans, Green and Co., 1881, 61-2. A similar sighting, (possibly on May 22, 1823), was explained as being a star near Venus by a youthful Webb. T.W. Webb. "The satellite of Venus." Nature, 14 (June 29, 1876): 193-5, at 195. "The planet Neith." Hardwicke's Science Gossip, 22 (1886): 178. C.A. Young. "The year's progress in astronomy." Transactions of the New York Academy of Sciences, 5 (May 17, 1886): 234-63, at 249. For more details of Houzeau's claims: "The problematical satellite of Venus. ", Observatory, 7 (1884): 222-6. 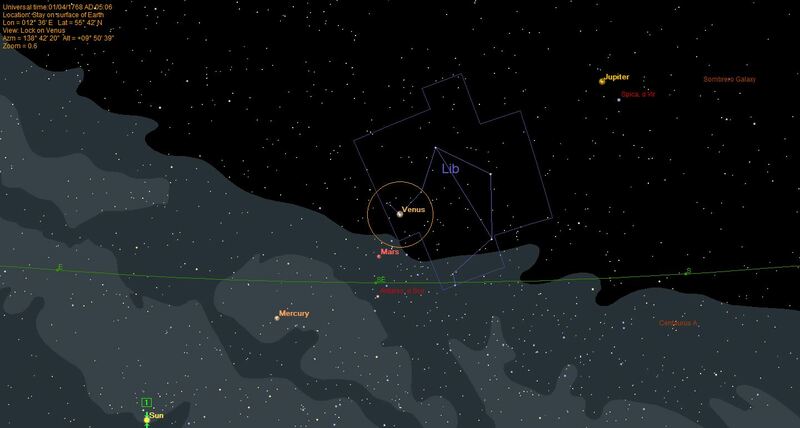 A second Redshift image gives the positions of Venus and the constellation Libra relative to the horizon and the Sun below it at 5:06 Universal Time. As a final note, Aubeck & Vallee spell Houzeau without the first ‘u.’ Fort spells it with a ‘u.’ This notice in The Observatory agrees with Fort. Merrill Cook is a former two-term Congressman from Utah who participated in the mock Congressional hearings, Citizens Hearing for Disclosure in 2013. The title of his talk was "UFO Disclosure," in which he would be discussing "how he would handle UFO disclosure as a former congressman as well as his experience at the Citizen Hearing on Disclosure. He will tell us about what he heard there, and the testimony from witnesses and researchers which showed him how deep this conspiracy can go." Cook rambled on about sightings, and lamented government skepticism. He called, of course, for real Congressional hearings on 'disclosure.' He cited the French COMETA report as an example of strong evidence for UFOs. However, John Alexander (who is certainly no UFO skeptic) has described the COMETA report as “an embarrassment… unsubstantiated data from questionable sources” in his book UFOs Myths, Conspiracies, and Realities. Lee Speigel, who writes Weird News for the Huffington Post, introduced and hosted the speaker that many had been waiting for, Jacques Vallee, one of the best-known UFO authors for more than 50 years, and one who seldom attends UFO conferences or other public events. Vallee's talk largely related to the content of the book he co-authored with Chris Aubeck in 2009, Wonders in the Sky, which describes reports of unidentified objects in the sky before the modern era. He related tales of such sightings from very credible astronomers and scientists in the 17th to 19th century, including Cassini, Leverrier, etc. (Vallee and Aubeck) launched an IndieGoGo campaign looking for $42,000 to publish 500 copies of a revised deluxe edition of Wonders in the Sky (2009), their demonstrably false and generally quite unreliable anthology of badly translated and frequently fictitious documents recording premodern UFO sightings....Let me say that again: $42,000 for 500 copies. That’s $84 per copy, for a book they are selling for $200 per copy.... What I’d like to point out, though, is a basic fact: Jacques Vallée is a very wealthy man. He is a venture capitalist, and according to Bloomberg.com, he is a general partner in SBV Ventures, a firm that operates more than 70 companies and has vast real estate holdings. He is also the managing partner of Runway Capital Partners LLC, a general partner of Astrolabe Ventures, and a partner at Red Planet Capital, a firm he founded in 2006. He sits on at least three corporate boards of directors. And here he is asking his fans to give him cash to print a book, money that someone in his position ought to simply have sitting in the petty cash drawer. rigorous investigator?” I’m sure that would have gone over well. Marc Dantonio and Douglas Trumbull provide an overview of the latest Exoplanet finds as motivation and reason why we should be looking for signs at home (Earth) of another civilization using advanced propulsion to visit us. Such signs we call the skidmarks of an advanced race. Marc and Douglas also provide an overview of their system called UFOTOG II which will remotely scan the skies using a variety of instruments, looking for these skidmarks which are actually the indirect physical and instrumental evidence we can detect of an advanced race using advanced propulsion in our universe. D'Antonio asked, Could someone else find us? We think they already have. We have plenty of circumstantial evidence, but no tangible proof. Trumbull noted that when he was five years old, he was taken to McMinnville, Oregon, home of the famous "classic" UFO photos of Farmer Trent. He saw an unidentified object, looking very much like the one in the photos, while he was there. He also told of discovering an "artifact" at the Airport (I'm not sure if this was still when he was five). However, it turned out to be just some concrete slag. (A concrete "artifact" is supposed to be very significant at the site of the alleged Aztec, N.M. "UFO crash.") These comments seem to suggest that Trumbull has been a UFO buff since at least age five, and apparently not a very discerning one. Trumbull talked about some of his movies, which include 2001: A Space Odyssey, Close Encounters of the Third Kind, Star Trek: The Motion Picture, Blade Runner, The Andromeda Strain (original version) and The Tree of Life. Theaters are now in decline, he said, a statement with which my son, who manages a large multiplex theater in the San Francisco Bay Area, strongly disagrees. He sees their business booming, especially among the younger folk. Both speakers talked about their UFOTOG I which was built, and UFOTOG II, which is planned. It is a multiple sensor device that will look for anomalous objects not only visually, but with magnetometers, gravity meters, spectroscopy, gamma ray and other detectors. Large numbers of them will be manufactured to get the costs down, and they will be placed on top of poles in areas where UFOs are being reported. Communicating via cell phone towers, their detection of radiation or magnetic events associated with anomalous objects might confirm that UFOs are “punching in” or out of other dimensions, as permitted by controversial theories in 'new physics.' While I seriously doubt that UFOTOG II, if built, will discover any such objects, you have to give them credit. This is clearly a Testable Hypothesis, a true rarity in UFOlogy. I wish them well. Trumbull remarked that Jeff Bezos, the billionaire founder of Amazon.com, is "knowledgeable" about UFOs and is "open to" them, suggesting that Bezos might contribute to such a project. When an event is widely experienced but seldom reported, we can refer to it as a “hidden event.” Many anomalous events, including UFOs, by appearing to violate common sense or scientific paradigms, fall into this category. My talk considers three types of hidden events: meteorites (18th century), the battered child syndrome (20th century), and UFOs (current). He left out #4, the most unreliable of all : UFOlogists and others who make extraordinary claims. 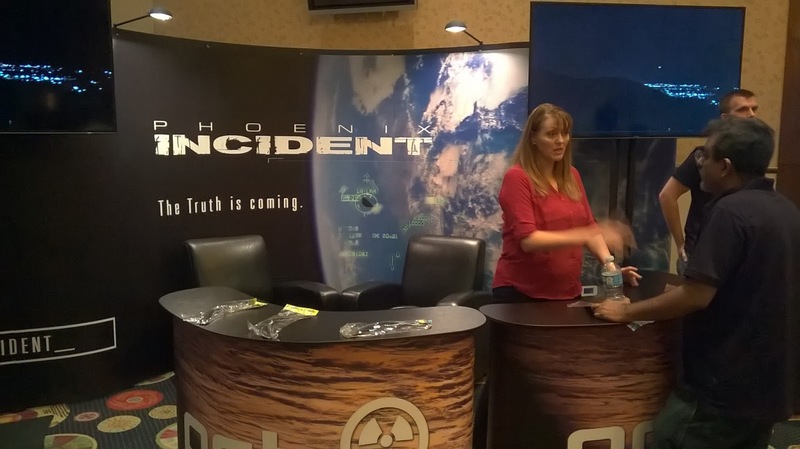 The last scheduled event was a panel discussion on "Mainstream Attitudes Toward UFOs." Dr. Westrum noted that certain subjects are effectively "taboo." He said that the late Cryptozoologist Dr. Roy Mackal told him that he realized he could never be promoted to full professor at the University of Chicago because of his pursuit of Nessie and other dubious beasts. The question was raised: why are UFOlogists so hostile to SETI? My answer is: because SETI hopes to provide evidence of alien intelligence someday, far out in space, while UFOlogists claim that the aliens are already here, but hiding. Somebody mentioned a journalistic UFO hoax, and Lee Speigel remarked, "I hate it when fellow journalists just make up crap!" Next year's UFO Congress will be in the same location, February 15-19, 2017. Look who won the raffle at the Banquet for the lovely painting of "star people" by a Native American artist - it's Leda Beluche! 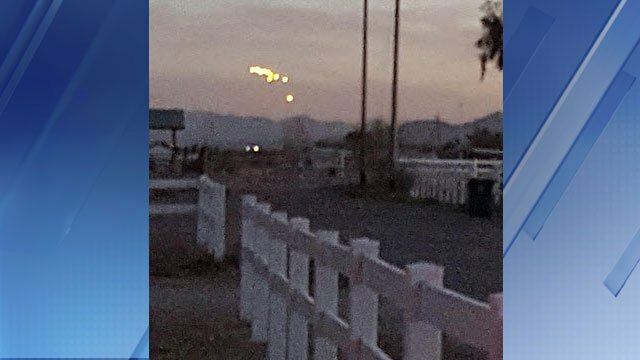 After sunset on Friday: While the conference goers were indoors watching the shaky "found footage" of The Phoenix Incident, the Air National Guard was dropping flares again. The movie received its premiere public showing at the UFO Congress at the close of the Friday session. It's mostly shaky, dark "found footage," left behind by guys who were eaten by aliens. The plot is: as Comet Hale-Bopp passes Earth, it is followed by a companion object, a UFO, which falls to earth and lands in Arizona. Out pour scary aliens, looking somewhat like the creatures in Alien, who start to eat people. Somehow the military covers it all up. The irony is this: while everyone was inside watching the premiere of this silly movie, the Air National Guard was busy dropping flares again over the Barry Goldwater range. And we didn't see them. Most of the people I spoke with afterward did not think the movie was very good, and doubted that it would have much long-term effect on the public perception of this incident. a new force was discovered in the 1950’s in Russia called “torsion,” and a research program was carried out over several decades which confirmed that it is a real force and it needs to be included in modern physics. It can explain many of the puzzles facing modern science, including the levitation of UFOs, paranormal phenomena and faster than light travel. Dr. Swanson’s book Life Force-The Scientific Basis describes some of the evidence for this force. The torsion force, he said, explains the human Aura. Dr. Swanson's talk also touched on Qigong (which kills cancer cells), orbs (which are probably living beings), acupuncture, remote healing, and remote viewing. It's all in the spin of the electron. Woo-hoo! Luigi Vendittelli is a UFO researcher from Montreal. He told of an incident where a woman in Montreal has photographed "beings" at close range. For some reason the Montreal police have the photos, but won't release them. Vendittelli introduced Emily Trim, who in 1994 was one of the schoolchildren involved in the famous Ariel School 'UFO landing' incident in Zimbabwe. She spoke on "E.T. Contacts and the Ariel School Incident." Her talk was highly emotional. She was crying as she spoke of encountering ETs floating above the ground. She said that she fell to her knees before one such being, whose face kept changing between that of an alien, and that of a lion. She has also had a conversation with a magic butterfly. the super-villain on South Park., "Reality." The audience liked Ms. Trim's talk so much that they gave her a standing ovation. As for me, I'm too much like that super-villain on South Park, "Reality." I'm sorry, I'm sure that Ms. Trim really believes this rubbish, but there is no "reality" in this. You cannot take seriously the account of someone who is in such a highly emotional state, and relates an impossible story. Powerful emotions obviously override all critical thinking and judgement. Accounts like hers belong to religion, not to science.